Germany is crowded with quaint villages, cosmopolitan cityscapes, and over 80 million people, but that does not mean it is devoid of green space. There are almost 100 official nature parks (Naturparks) around the country that make-up approximately 25 percent of the total land area of Germany. Always a welcome respite from city life, a visit to the many parks are especially welcome during the glorious autumn (Herbst) months. Between rain showers (always be prepared for the frequent flips in weather), the changing of the leaves is a spectacular sight. 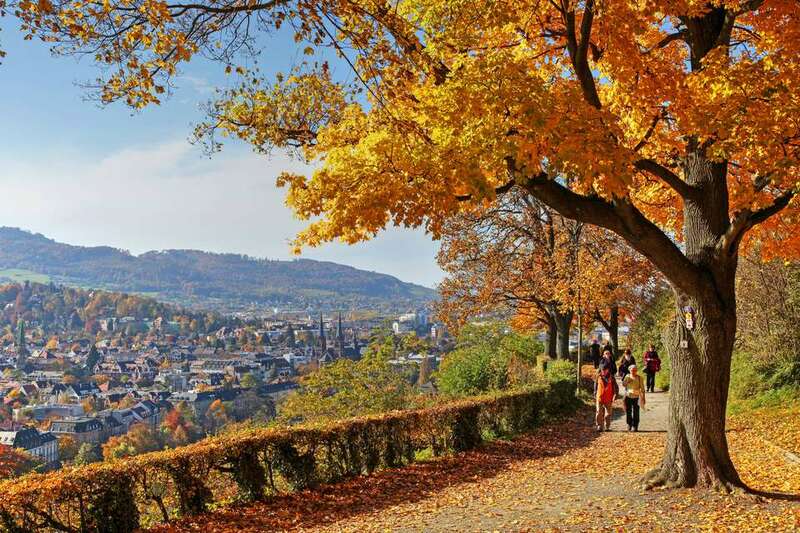 Whether you are looking for a place to explore in your own Stadt or planning a scenic drive through one of the beautifully wooded regions, these are the top places to see autumn leaves in Germany. The world-famous Black Forest (Schwarzwald) is the birthplace of German fairy tales (although the authors, the Grimm Brothers, found their final resting place in Berlin) and the largest nature reserve in Germany at 3,750 square miles. Densely covered in evergreens, it has enough changing foliage along its rolling landscape to provide a cornucopia of fall colors. If you are planning a drive, the A 5 (E35) motorway offers a major artery through the forest. Look for signs marking 60 km of Schwarzwaldhochstraße. The Deutsche Uhrenstraße (German Clock Route) also offers a picturesque route for leaf-seekers. The capital's largest park was once only open to the Royals. The Tiergarten was the hunting grounds of the electors of Brandenburg before Friedrich I, the first Prussian king, provided access to the park by building roads throughout. 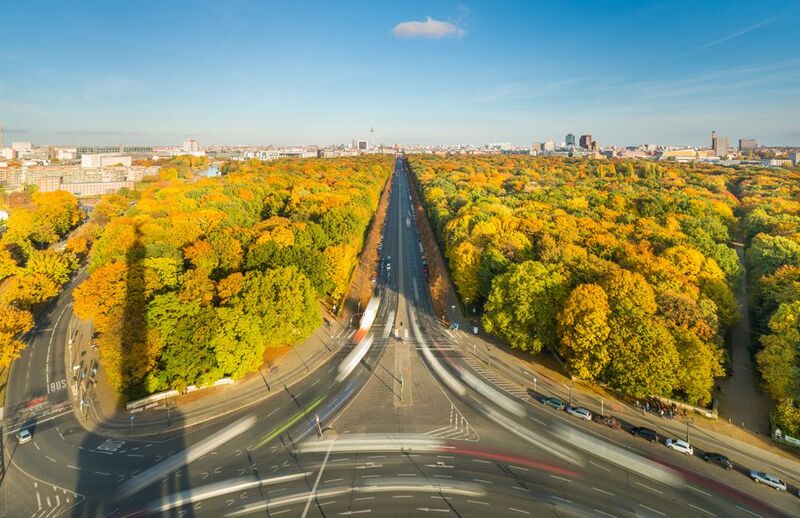 It's sprawling 2.5 square km (about 1 square mile) within the center of Berlin offers over 23 km (14 miles) of pathways to walk, bike or run among the flora. Note that the trees here only date from World War II as following the war, Berliners were forced to cut down the city forest to survive the icy winter months. The German Wine Road in the state of Rhineland Palatinate (Rheinland-Pfalz) is the oldest of Germany's tourist wine routes and an idyllic drive throughout the year, but no time may be more lovely than in the fall. Coinciding with many of the region's wine festivals, the changing of the leaves offers an additional pop of color. A popular destination for city-dwellers just an hour outside of Berlin, the Spreewald has been called the “green lung” of Brandenburg. A UNESCO protected biosphere, towering trees loom over thousands of man-made waterways. This escape should not be forgotten in the fall. The impressive greenery featured throughout the summer takes on glowing yellow, oranges and red hues as you glide along the canals. The section of Bavaria generally identified as Franconia is another highlight of autumn colors. Visit one of its charming cities, and walk the streets among the falling leaves. The Naturpark Lüneburger Heide is the oldest nature park in Germany. Established in 1921 as a nature reserve, it has been expanded to more than four times its original area at 1,130 square kilometers (440 sq miles). The high proportion of woods make the park one of the largest areas of protected woodland in Germany and an ideal place to connect with nature in the fall.